Generals.dk. Fair use may apply. 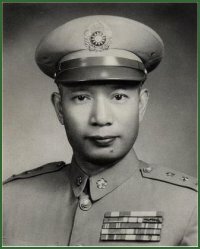 Huang Chieh (Huang Jie) took command of 11 Army Group in northern Burma when it moved too slowly during the campaign to open the Burma Road. During the Chinese Civil War he was forced to retreat into French Indochina, where the French were initially inclined to intern his forces rather than risk Chinese Communist intervention in their own conflict. Postwar Huang rose to command of the Nationalist Army and Minister of Defense.